How Does Your Eye Doctor Diagnose Glaucoma? You might be surprised at how many tests eye doctors use to diagnose glaucoma. 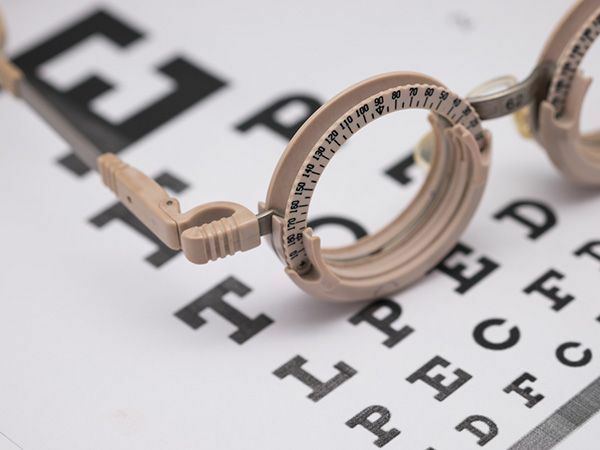 A proper diagnosis requires careful evaluation of many aspects of your eye’s health – from eye pressure to cornea thickness to the health of your optic nerve. This blog describes how your eye doctor assesses your risk and all the tests needed to properly diagnose glaucoma. Your type of eyesight is also important. People with farsightedness are more at risk for narrow-angle glaucoma, which is a more serious type that can advance quickly. Nearsightedness is associated with open-angle glaucoma, which progresses slowly with no symptoms. Tonometry measures the pressure within your eye. Your eye doctor will give you drops to numb your eyes. Then he/she uses a device called a tonometer, which applies a small amount of pressure with a warm puff of air. Eye pressure is unique to each person, so it’s not always a reliable indicator for glaucoma. It’s simply another piece of information to help your eye doctor assess your eyes. The range for normal pressure is 12-22 mm Hg (“mm Hg” is millimeters of mercury, a scale for recording eye pressure). Most glaucoma cases are diagnosed with pressure over 20mm Hg. However, some people can have glaucoma at pressures between 12 -22mm Hg. This is an examination of your optic nerve. 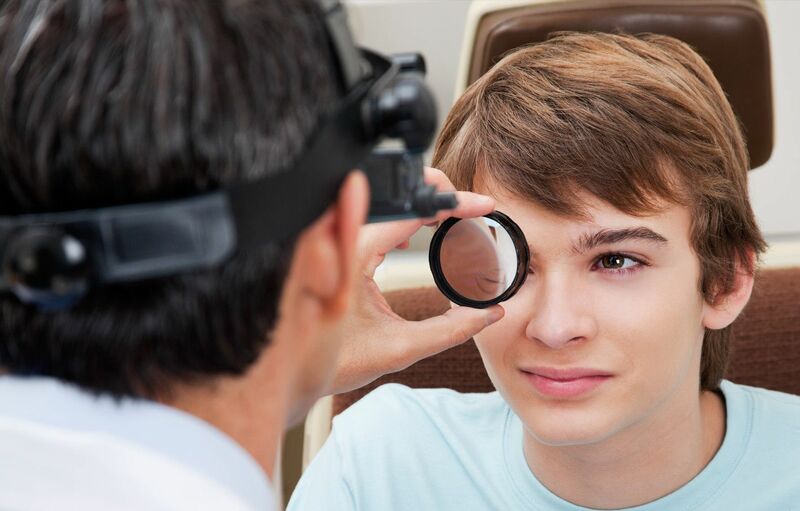 Your eye doctor will use eye drops to dilate the pupil, which makes it possible to see through your eye to examine the shape and color of the optic nerve. Then, using a small device with a light on the end, your optic nerve is magnified. Based on the results of these tests, your doctor may ask you to have more glaucoma exams. 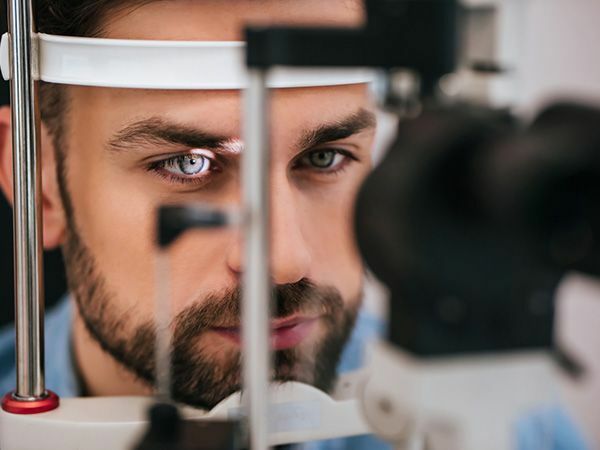 Depending on the equipment available and the specialties of your optometrist, you may be referred to an ophthalmologist, who has more training in eye diseases. Ophthalmologists are medical doctors who specialize in eyes. Perimetry is a visual field test. It creates a map of your complete field of vision. During this test, you’ll look straight ahead and then indicate when a moving light passes your peripheral (or side) vision. Try to relax and respond as accurately as possible. To ensure accuracy, your doctor may repeat the test to see if the results are the same the next time. If you’ve been diagnosed with glaucoma, a visual field test is usually recommended at least once per year to assess changes to your vision. This diagnostic exam helps determine the angle of your iris and cornea. First, you’ll receive eye drops to numb the eye. A hand-held contact lens is gently placed on the eye. A mirror on the contact lens shows the doctor if the angle is closed and blocked (a possible sign of angle-closure or acute glaucoma) or wide and open (a possible sign of open-angle, chronic glaucoma). Last, your eye doctor may want to use pachymetry as another way to confirm the diagnosis. This measures the thickness of your cornea. This is the clear window at the front of the eye. A probe called a pachymeter is gently placed on your cornea to measure its thickness. Pachymetry can help clarify your diagnosis because corneal thickness has the potential to influence eye pressure readings. Retinal imaging takes a digital picture of the back of your eye. It shows the retina (where light and images hit), the optic disk (a spot on the retina that holds the optic nerve, which sends information to the brain), and blood vessels. Glaucoma diagnosis is not as simple as you might expect. Be sure to have regular eye exams, especially if you have any of the risk factors, to detect glaucoma early.